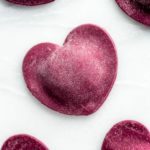 These heart beet ravioli are perfect to make for Valentine’s day activity and so delicious! Learn how to make pasta at home rather than going to an Italian restaurant! 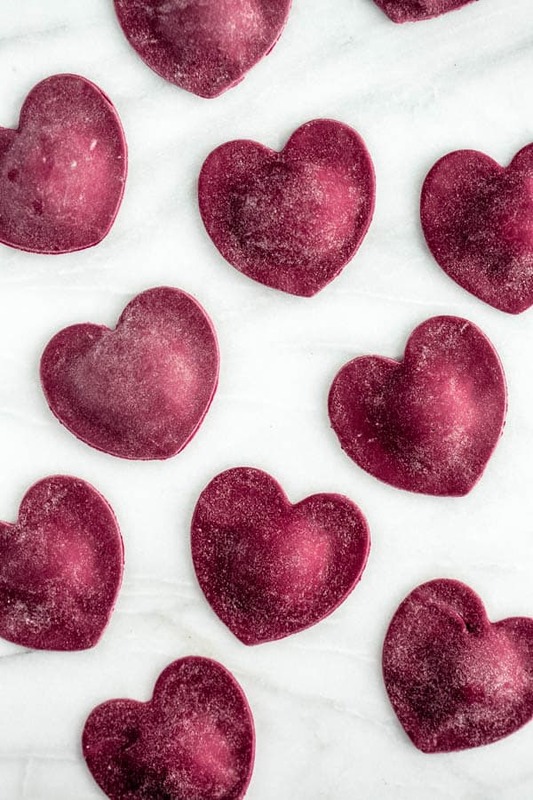 Today we’re making heart beet ravioli. 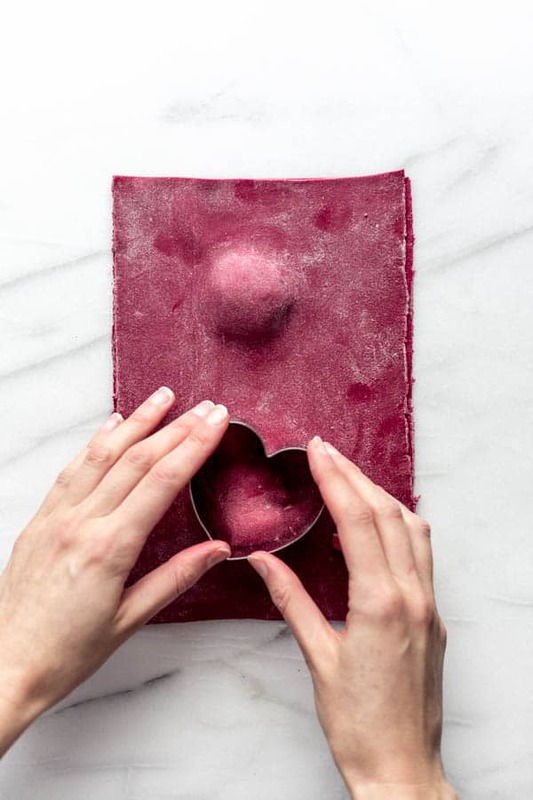 As in heart shaped raviolis, made with beets in the dough. 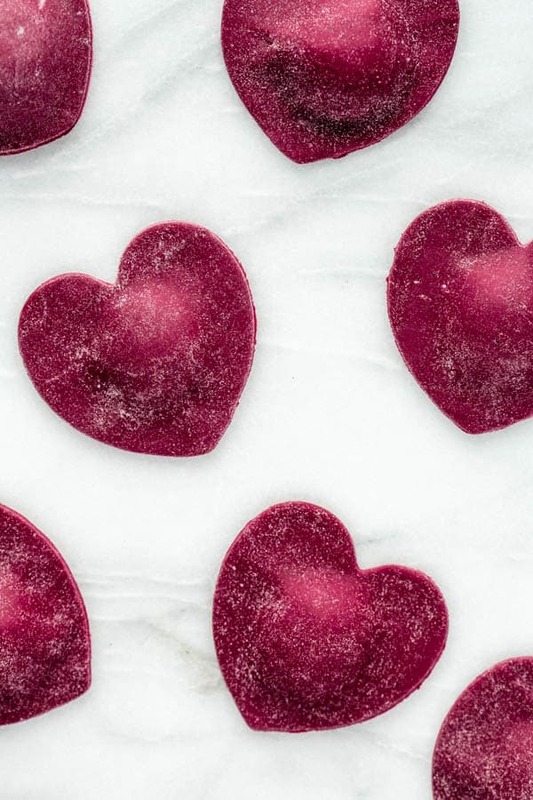 As in heart beet…like heart beat…but beet…get it? Ahhh I love a good play on words! Whether you’re celebrating Valentine’s day as a couple (or maybe you’re celebrating Galentine’s day?) 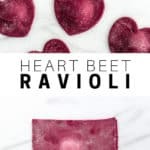 or just want a fun activity to do for an evening in, this heart beet ravioli recipe is where the fun’s at! ok, so the question on everyone’s mind right now is how to make homemade pasta. To make the pasta dough, you start by pouring the flour onto a clean surface and making a well in the centre for the egg. Then once the egg is added, you start mixing the flour into it until it forms a dough. After the dough is formed you run the dough through the pasta machine on the largest setting several times (I do this about 5-6 times) to help incorporate the dough, and then start running it through the pasta machine on a smaller setting each time. Once it’s nice and thin your dough is finished and you can cut it into noodles, or use it to make raviolis! 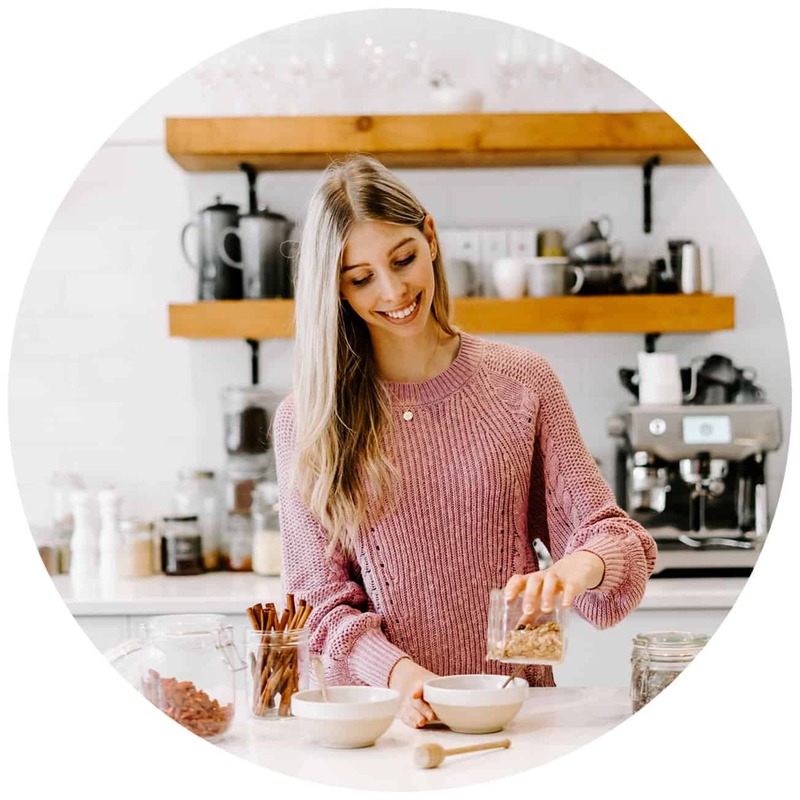 If this process feels at all intimating to you this youtube video is helpful to show you these steps in action! I use a ricotta and mint filling for these raviolis, but you can use any type of filling you like. You can also use any of your favourite pasta sauce for the raviolis. My preference is to just toss these in a little bit of garlic butter and top them off with some freshly grated parmesan cheese. But you can also go for a tomato sauce or a pesto if you prefer! 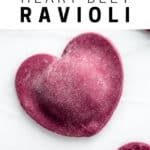 Alright, sending you all lots of ravioli love! 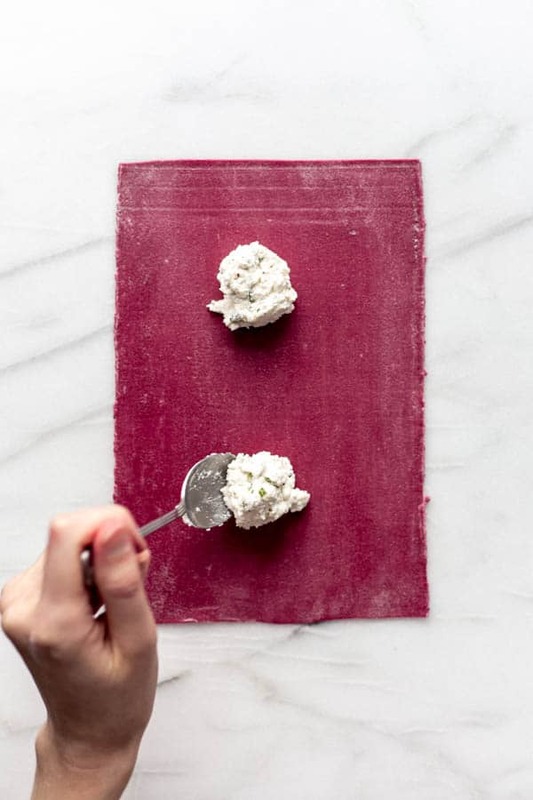 Homemade ravioli with beet dough and a ricotta mint filling, YUM! Start by making the filling. 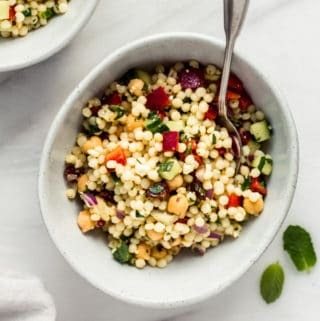 Mix all filling ingredients together in a bowl and place in the fridge. To make the ravioli, place the flour on a clean surface. Make a well in the centre and add the eggs. 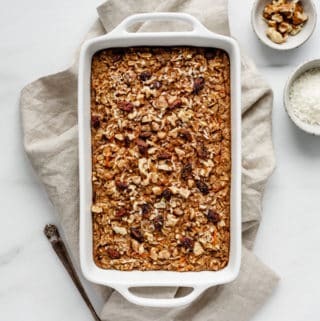 Mix together with a fork to incorporate, then use your hands to knead until smooth and elastic, about 5-10 minutes, add a pinch of extra flour if necessary to keep dough from sticking, and a pinch of water if your dough feels too dry. Cover and let rest for 30 minutes. Cut the dough into quarters, take one piece and run it through a pasta machine on the largest setting 4-5 times. place 1 heaping teaspoon of filling 2 inches apart over a pasta sheet. Brush around filling with water to moisten place a second sheet over, pressing down to seal. 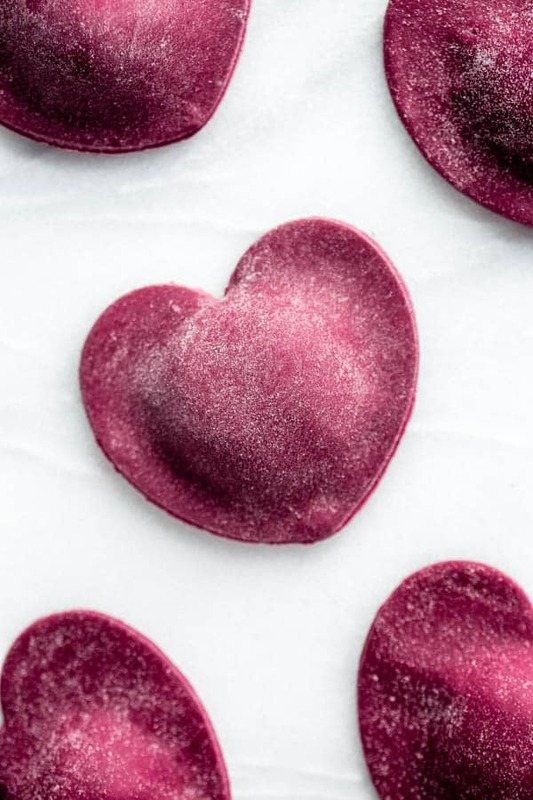 Use a heart-shaped cutter to cut into hearts, then give each ravioli a press around the edges to make sure they are sealed. 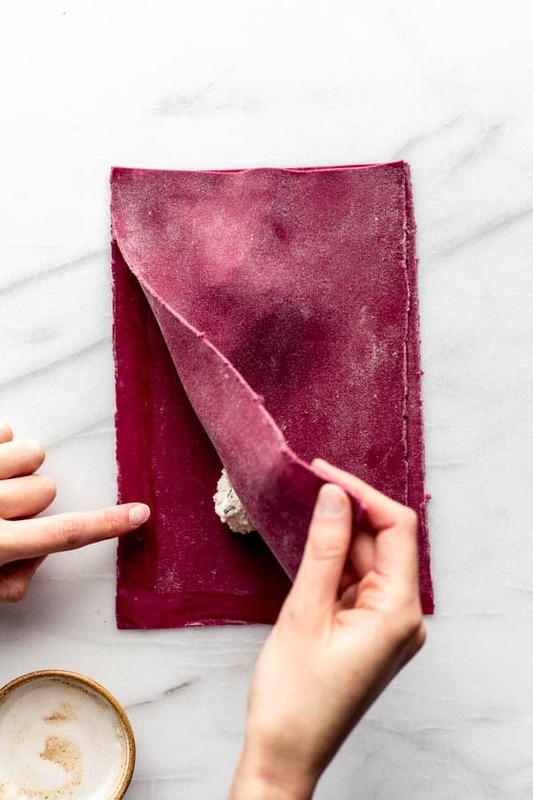 To make the beet puree blend 1 cooked beat until smooth and creamy. Serve this pasta with your favourite sauce. 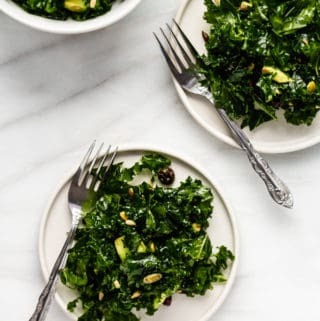 They’re delicious tossed in some browned butter or with a pesto! I use this pasta machine to make this recipe. 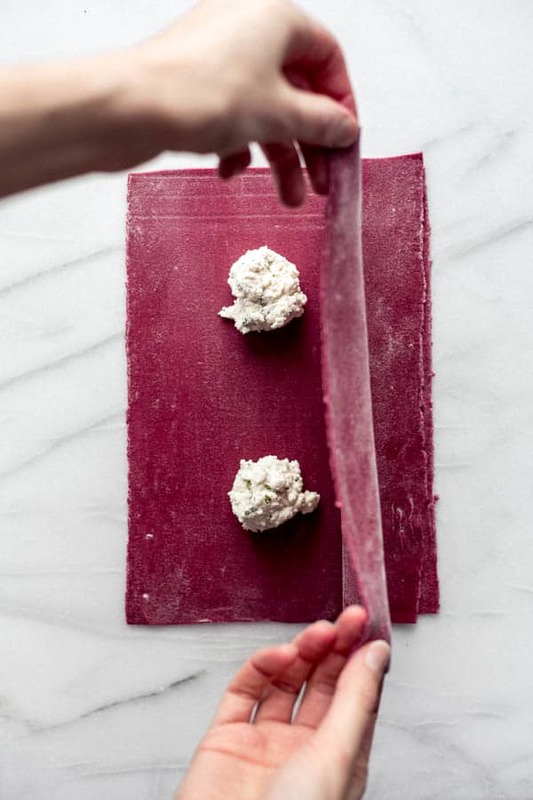 If you don’t have a pasta machine, you can also use a rolling pin and keep rolling the dough until it’s thin. 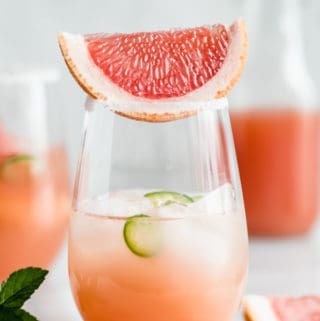 These look so cute and pretty ? Such a great idea for Valentine’s Day! These were seriously awesome and so much fun to make!